How is it already December?! The weather here has been super mild, in the 50s everyday, so it's hard to believe we're expecting snow, or rather, Christmastime anytime soon. To attempt to get in the holiday spirit despite the warmer weather and my later exam schedule this year (I'm at school until the 21st! 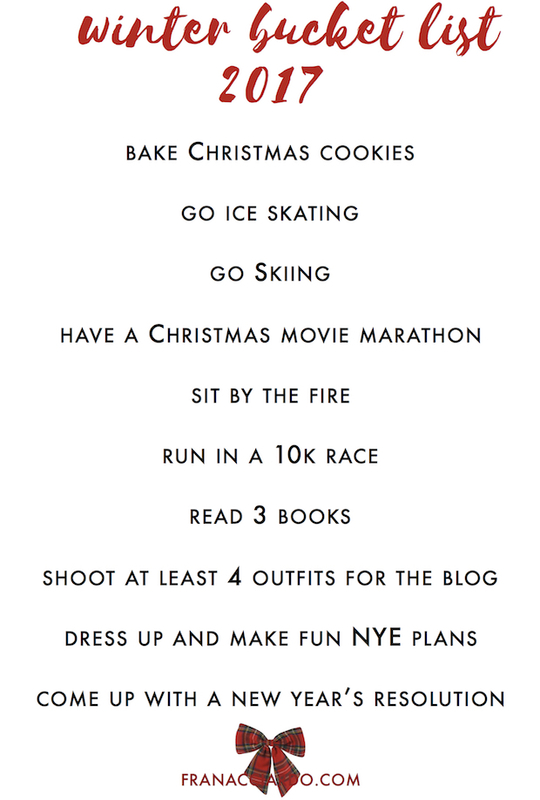 ), I thought it would be fun to create a winter bucket list that hopefully you can all use too! I realistically won't be able to do all of this during this month because I'll mostly be at school and then I'm heading straight to Dallas for Christmas, but throughout winter break I'm hoping to cross off a few of these items from the list. My favorites are buckeyes (my mom has made these every year for as long as I can remember-- the key is using rice krispies), soft ginger molasses cookies (Jack's mom brought a version of these to our party last year and they were probably my favorites of all the cookies... I need to ask her for the recipe! ), and crinkle cookies!!! I honestly love all Christmas cookies (how could you not?) but I think if I had to choose, those would be at the top of my list. What are your faves? Do you have a recipe I need to check out? 2. Go ice skating // I'm lucky that this is so easy to do in Milwaukee while I'm home! There are three places to go ice skating within 20 minutes of my house, and I especially love the outdoor rink downtown. It always makes for a fun date night or an easy activity with girlfriends. 3. Go skiing // This requires a bit more planning, but I'm lucky that Jack is a ski instructor at one of the ski hills near us, so it's easy to go with him if we just pick a day or night to go! We skied a few times over winter break last year, and I went to Vermont for part of my spring break this year where I think I definitely improved my skills. 4. Have a Christmas Movie Marathon // Home Alone was on Wednesday night on Freeform as part of their 25 days of Christmas, and it definitely got me way too eager to dedicate a day of winter break to watching Christmas movies all day long.... how nice does it sound to hang out on the couch in pajamas with cookies and hot chocolate for hours without moving? Ultimate lazy day goals!! I need to see a few of the classics that I've never before watched... like It's a Wonderful Life, a Very Murray Christmas, and Miracle on 34th Street! 6. Run in a 10k Race // I had a great plan to run a 5k Turkey Trot on Thanksgiving, but no one in my family wanted to do it with me (lol, if you know my family, you won't be surprised at all), so now I want to sign up for a race on New Years Eve in Milwaukee! There is a 5k and a 10k that I know of, and I am so down to do it!! I'll be recruiting a friends or two for sure. 7. Read 3 Books // What better time to read a few new books than during the winter all snuggled up by the fire?! I shared my latest read in my blog post yesterday. 8. Shoot at least 4 outfits for the blog // In an ideal world, I would post 1-2 outfit posts per week on the blog. I have been horrible about shooting photos throughout 2017, and I want to kick off the year well by shooting at least 4 outfits over winter break. 9. Dress up and make fun NYE plans! // I love nothing more than a good excuse to dress up, and New Year's Eve is such a fun occasion to do so. My friends and I are already brainstorming party ideas! 10. Come up with a New Year's Resolution // I think New Year's Resolutions are a great idea, but rarely does anyone stick to them for a whole year. I want to come up with something that is meaningful and would actually impact my life in a positive way. Maybe something like no phone before bed? That's one habit I need to kick! I'm terrible about being on my phone for endless amounts of time when I'm "trying to fall asleep." What's on your winter bucket list? I hope you all enjoyed this post, I had a ton of fun writing it! Such a good list- Every year a couple of my friends and I bake cookies and take them to the local fire station, so I'm hoping we are able to do that with all the busy schedules!!! !